Anyone who has watched a “Will It Blend?” video knows the answer to that question is, “Of course.” iPhone? Yes. iPad? Yep. Golf balls? You betcha. Created by Blendtec’s Founder Tom Dickson to demonstrate the power of his blenders, “Will It Blend?” is the stuff of viral marketing legends. Since 2006, Dickson has starred in more than 140 videos that have a combined 256 million views on YouTube. 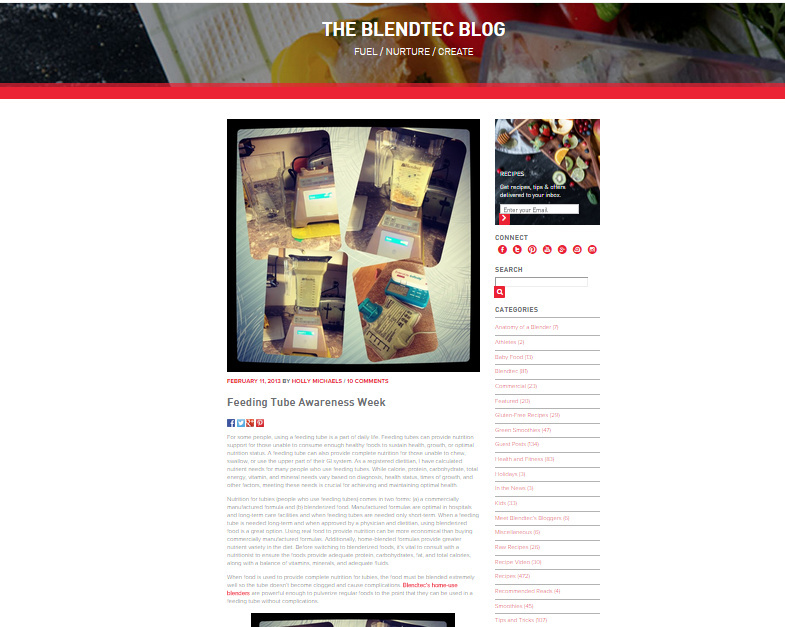 “Will It Blend?” was a wonderfully successful experiment, says Rick Galan, Blendtec’s director of digital marketing. The videos have been a powerful (and fun) awareness engine for the brand. But while the campy “don’t-try-this-at-home” campaign has made millions aware of the brand, the audience is so broad it’s safe to say many are more interested in destruction than in nutrition. “We sell an aspirational product,” says Senior Content Marketing Manager Mike Jensen. With many models priced in the $400 to $600 range, a Blendtec blender isn’t one of those kitchen gadgets someone uses a few times and relegates to the back of a cabinet. To sell blenders, Blendtec needs to reach the right people – people who see a high-end blender as an important part of their lifestyle. For Blendtec, this means complementing the breadth of the original “Will It Blend?” campaign with the depth afforded by influencer marketing. By creating more relevant and targeted content, the company’s influencers help Blendtec reach and build credibility with prospective customers – not only in the consumer market, but also with retailers and business owners. To help build relationships with a diverse group of brand ambassadors, Blendtec representatives attend a variety of events, from blogger conferences to Crossfit competitions. They set up a booth, hang out, and hand out smoothies. “The biggest tactic is just to be one of them,” says Galan. As a result, Blendtec doesn’t need to do much prospecting to find bloggers and Instagrammers – there’s a waiting list of content creators who want to partner with Blendtec, often in exchange for a product giveaway that helps them grow their own audience. Giveaways help both parties expand their reach. “Our influencers are excited. As content marketers, it’s a dream,” Jensen says. One of Blendtec’s less obvious brand ambassadors is Billy DeCola, a tattoo artist familiar to viewers of TLC’s reality show NY Ink. The tattoo artist reached out to the company, telling Blendtec that he often makes smoothies for his young daughter. 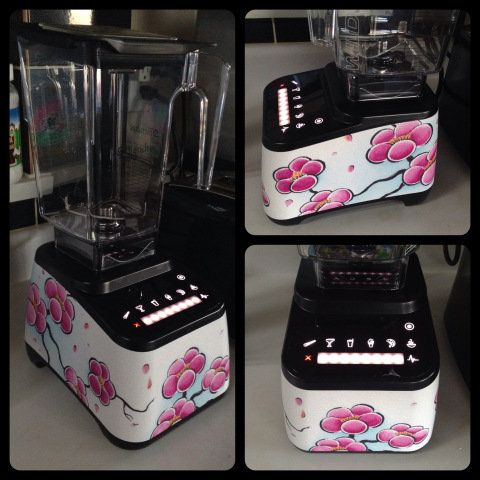 Blendtec and DeCola partnered for a designer blender that features an original cherry blossom watercolor design by DeCola. The tattoo design has inspired other custom collaborations, including a berry design for a California Giant Berry Farms blender giveaway and a graffiti blender created for the Dew Tour sports event. Blendtec’s content marketing strategy focuses on the customer journey in three different categories – fuel, nurture, and create – and the company partners with experts and thought leaders in each of these areas. Content in the fuel category demonstrates how Blendtec complements a lifestyle for athletes and those passionate about nutrition. From the Seattle Seahawks (the NFL team even has its own Seahawks Stealth Smoothie) to local cycling teams, Blendtec shows how its products help professional, semi-pro, and amateur athletes achieve their goals. Content is created by dietitians, nutritionists, and the athletes themselves. A key audience for nurture content is, as one might expect, parents. The parent-generated content is focused on making real food at home and ensuring kids are getting their vitamins through smoothies and other healthy foods. Nurture content also comes from among the large community of food bloggers, for whom taking pictures of their food – and the tools they use to prepare it – is second nature. 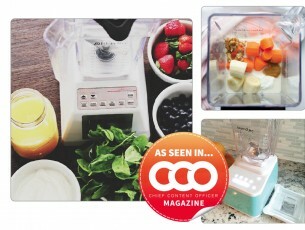 Blendtec’s create content comes from chefs, artists, and small business owners. Instead of reaching out to producers to get Blendtec’s products placed on cooking shows, Blendtec prefers to work directly with the chefs who can inspire others to create better food. Blendtec has partnered with culinary institutes, as well as spas and estheticians who use Blendtec blenders to produce their products. Working with online personalities happened organically at first, Jensen says. But the company’s decision to support and invest in influencer marketing was intentional. Partnering with people who create content about food, health, and nutrition was a natural fit for the brand. Blendtec itself has a nutritionist on staff and the company creates a range of recipes for its website, email newsletter, and social media channels. While the Orem, Utah-based company has been in business since 1989, historically the focus has been on engineering blenders, not content. As Blendtec has grown, so have the company’s digital, creative, and product-marketing teams, enabling Blendtec to produce more content including blog posts, videos, recipes, and infographics. (A recent infographic featuring Buffalo Wild Wings copycat recipes was especially popular, and helped expand Blendtec’s reach beyond the smoothie audience.) The digital team is exploring Vine, Facebook video, and Instagram. Analytics help drive content creation: Video views, social engagement, and website traffic are all taken into account when it comes to planning ahead. Like other content marketers, Jensen is interested in getting more sophisticated with Blendtec’s data, refining the metrics that help the company connect influencer marketing with sales figures and measure lifetime acquisition. Despite the company’s recent growth, Galan says, “We can’t generate content at the kind of scale we need to engage with our audience.” Therefore, bringing on new brand ambassadors as well as supporting ongoing relationships with influencers remains a priority. So does finding and curating compelling stories among the many customer reactions shared with Blendtec every day through its website and social media. One such story comes from a customer who uses her Blendtec blender to make smoothies for her child who relies on a feeding tube – a touching story that fits squarely into Blendtec’s nurture category. And while Blendtec looks to the future, the company has no plans to leave “Will It Blend?” behind. There’s a long list of items waiting to be blended, and fans submit new suggestions every day. This article originally appeared in the June issue of Chief Content Officer. Sign up to receive your free subscription to our bi-monthly print magazine. Natalya Minkovsky is a content strategist who lives and works in Washington, DC. Follow her on Twitter @hejhejnatalya.